However, if you are trying to travel between Center City and the airport, SEPTA Regional Rail is almost certainly your fastest, and least expensive, option. The fare is $5.50 each way, per person. Of course, its cost-effectiveness varies, depending on the size of your party. You can take a cab from the airport to Center City, if you're really strapped for time. But it will be more expensive - and depending on whether it's rush hour, it might actually take you longer to reach Center City, than you would on the SEPTA train. The fare is $28.50 one way, more expensive, but if there are several of you, it's more cost-effective than the train. Also, if you have a non-Center City destination, and/or your destination is not particularly close to one of the three SEPTA Regional Rail stations, you're better off with the cab. At night, post-rush hour, you shouldn't encounter much traffic. But for the AM or PM rush, the train might be your best bet. Here's a chronology of the airport's surprisingly rich history. The Airport has risen from humble beginnings - 40,000 passengers in 1940 - to 31.8 million annual passengers, today; it ranks among the 10 busiest in America. 1917-18 - America's entrance into World War I means that ships must now be manufactured, as quickly as possible. Accordingly, to supplement the city's vast shipbuilding industry, a thousand-acre site at what is known as Hog Island is hastily converted into emergency shipyards to help the war effort. 1925 - The city furnishes 125 acres of land, in order to provide a training facility for National Guard aviators. 1926 - Ludington Exhibition Company - the ancestor of the now-defunct Eastern Airlines - and the city arrive at an agreement, for the Company to run the airport as the "Municipal Aviation Landing Field". October 22, 1927 - The most famous pilot and plane in aviation history - Charles A. Lindbergh and his Spirit of St. Louis - become its first-ever arrival. Lindbergh's popularity was at its peak, as he had just completed his famous nonstop flight from New York to Paris. The stop at the new Philadelphia airport was part of a national tour. Symbolically, Lindberg raised the American flag to officially change the name to "Philadelphia Municipal Airport". 1930 Hog Island's emergency shipyards are no longer necessary, and have become dilapidated. The year following the stock market crash, the city buys Hog Island from the federal government for $3 million (approximately $38.7 million, today. However, due to the Great Depression, the site remains inactive for several years. 1937 Construction finally gets underway, of the building and landing field. June 20, 1940 The new, post-Hog Island, expanded airport formally opens as "Philadelphia Municipal Airport". World War II has already begun in Europe, but America has not yet officially entered it. Four airlines - Eastern, TWA, United, and American - had previously been offering Philadelphia service, via Central Airport in Camden, New Jersey, directly across the Delaware River from Center City. But with the new Philadelphia Municipal Airport, they cease operations in Camden. Through the remainder of 1940, 40,000 passengers pass through the new airport. 1943 - With America now fully engaged in World War II, the airport is closed to commercial air service, as a matter of national security. June 26, 1945 - A second airport opens on the city's far northeastern outskirts, Northeast Philadelphia Airport, at a cost of $3.5 million (approximately $41.9 million, today. This means that commercial air service has returned to Philadelphia after two years without it. It continues to operate, today. 1950 - Construction gets underway on a new, $15 million terminal project construction. Its cost would be approximately $134 million today. December 15, 1953 - The new terminal is officially dedicated. Late 1960s - The City and the Airport collaborate to figure out ways of modernizing and expanding the facility, in light of increased air travel and advances in technology, in what has become known as "the jet age". New passenger facilities and airfields are constructed. However, the main project is a $22 million, all-weather runway, with high-speed taxiways. April 1973 - An Overseas Terminal is opened, at a cost of $3 million in 1970 dollars ($16.6 million today). It will handle international travel for the next 18 years. Spring, 1977 - The domestic terminal facility is upgraded and modernized. The main consequence is the organization of the facility from a "central facility" to one of separate, lettered terminals - B, C, D, and E. The domestic terminal project is completed at a cost of $300 million in 1977 dollars ($1.07 billion, today). Two multi-level parking garages are also included in the project, at a cost of $24 million ($85.3 million, today), through a bond issue. December 1981 - A new Federal Aviation Association air traffic control facility opens. 1985 - SEPTA launches its new Regional Rail R1 Airport Line train service - the same one recommended, above - to the Airport. Late 1980s - A six-year, $695 million capital program gets underway. Its main purpose is to construct a brand-new terminal - Terminal A - and entirely renovate the existing Terminals B, C, D, and E. Secondary projects include improving the signage and adding another multi-level parking garage, with 2,800 additional spaces. June 1998 - The newly consolidated Terminals B/C are opened. Another giant step forward was the creation of the Philadelphia MarketPlace at the Airport, providing travelers with the opportunity for retail shopping and increased food options. August 2, 1999 - Groundbreaking on two new terminals takes place - Terminal F and the new international Terminal A-West. June 17, 2001 - The new Terminal F opens. Built at a cost of $150 million, the 185,000-square-foot terminal can accommodate 6 million passengers, with 38 gates, and another, 3.800-space parking garage. It is one of the first American airport terminals that can accommodate "jet bridges", which permits passengers to travel directly from the terminal to commuter aircraft. May 2, 2003 - The new Terminal A-West opens. Built at a cost of over half a billion dollars ($550 million), the 800,000-square-foot terminal currently accommodates nearly 4 million international passengers, annually. Aesthetically, it contains Arrivals Hall, with an atrium and fine artwork, conveying Philadelphia's rich and textured history to visitors. 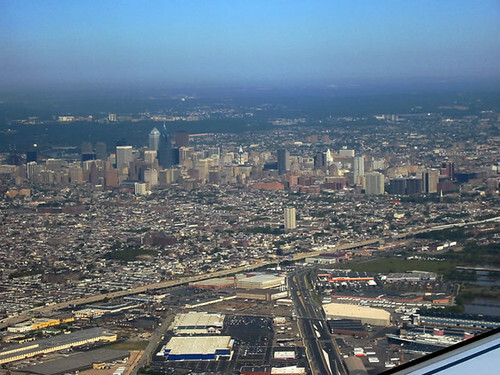 If you'd like to leave Philadelphia International Airport, and return to the home page of Enjoying Philadelphia, please click here.